So, just because you don’t like Secret Wars and I do, I have to find something good to say about this loser? Seriously? This is what we’ve come to? I can spin horribly snarky comments about Secret Wars if you give me someone else to work with. Honestly, I’d rather talk about Serpentor. Hmmm. I wonder if I’d break the blog if I instead spent this time discussing that, while Serpentor was horribly stupid in the TV show, Larry Hama actually made him a neat character in the GI Joe comic. Hama had a deft way of taking some of the stupidest characters created for the GI Joe toyline (Dr. Mindbender anyone?) and making them work. The comic went a little off the rails when it became ninja showcase and everyone had a connection to Snake-Eyes, but overall, it was really rather good. In fact, I….what? Aw, c’mon, do I have to discuss this loser? Ok, fine, but I want a raise. Ahem. Century. Ah, good old Century. Part of my problem with this uber-loser is that I have read very few comics that feature him. I’ve read a few comics where he appears, but he never does or says much, so I have no connection to him. I may pick on a character like Ka-Zar, but I’ve read tons of his stories and have an opinion on him. Century is a blank slate to me and even after reading his history, he still means nothing to me. There’s no interest on my part, so I’ll be phoning in the rest of this entry (literally, as I’m dictating this to my secretary as I drive off to get my massage). Honestly, feel free to skip this and then come back and read the next entry. Or go back and re-read what we did with the Defenders and Dr. Strange. Good entries, those. The scary thing about Century is that I found his biography on the Marvel site. Do they plan to reuse this character? That’s a sad state of affairs, if they’re using Century in some upcoming project. Actually, after reading his history (which was so convoluted and dull I fell asleep three times), and all the information they had on him, I still have no idea what he can do, although I know his staff (named Parallax) can transport him through time and place. 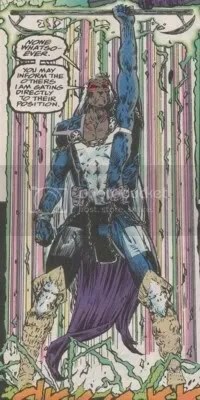 I think the best use of this character would have been to make his staff actually be Hal Jordan, back from when he was busting up the DC Universe as a cosmic baddie named Parallax. That would have been epic! It’s a perfect fit! This would have been part of Hal Jordan’s master plan. He wanted to sneak onto Force Works, the quintessential 90s super hero team (all ideas, no substance) on the back of the quintessential 90s super hero (Century had an odd appearance, amnesia and vaguely defined powers). Then, when the time was right, he could have destroyed Century and all the other evil characters from that horrible decade, thereby reclaiming the Marvel Universe for the good old American values he loved! Well, I give up. My suggestion? Century has always been a skrull, which will be revealed in Secret Invasion #6, and he’ll be killed by the Scarlet Witch, who wants him dead before Marvel acts on the fact that he was in love with her and puts them in a relationship. After being married to an android and being involved with a man made of ionic energy, she really wanted to be with Bob the manager of the local Target, a normal, made of non-wrinkly flesh, human being. The end. *Pfft. * I almost spit Coke Zero (yeah, I’m trying to lose a few pounds) all over my screen when I read that last paragraph. Ahhh…Century. Good times. So what loser are you going to saddle me with?